The Golden Globes were held this past Sunday, and like most award shows, they were not without their share of controversy. One such example, however, was thanks to the Twitter account of MTV Australia. The set-up: Actresses Eva Longoria and America Ferrera were presenting an award and joking about who they were, a reference to people who confuse Latina actresses. At the same time, they were making fun of the Golden Globes Twitter account, which confused Ferrera with actress Gina Rodriguez in a December 2015 tweet. Ooof. As you would expect, the internet was less than pleased. Our Tweet was in reference to @EvaLongoria & @AmericaFerrera’s #GoldenGlobes joke. We sincerely apologise for causing offence. If you take MTV Australia’s explanation at face value, then you can at least understand how such a mistake could have happened. That being said, someone should have thought this one through . It’s obvious to see how the tweet could have been interpreted as racist, and any major business (or politician!) needs to be extremely careful when they tweet about issues as weighty as race and racism. This is a bit of a weird one. I say weird because I find myself in the unlikely position of interpreting a tweet sent by Donald Trump in a more positive light than others. Yep. That’s weird. The tweet also inspired a variety of news stories and briefly made #ParisIsInGermany a trending topic on Twitter. My opinion? This was a poorly worded tweet. Donald Trump is many things, but I don’t think he – or anyone on his campaign – really thinks Paris is in Germany. Germany has had a spike in violence, including as many as 80 sexual assaults on New Year’s Eve in Cologne, and that is likely what Mr. Trump was referring to. However, the phrasing of the tweet – which is obviously condensed by the 140 character limitation – lent itself to the interpretation that Mr. Trump thinks Paris is in Germany. The lesson here? Careful with how you tweet things. 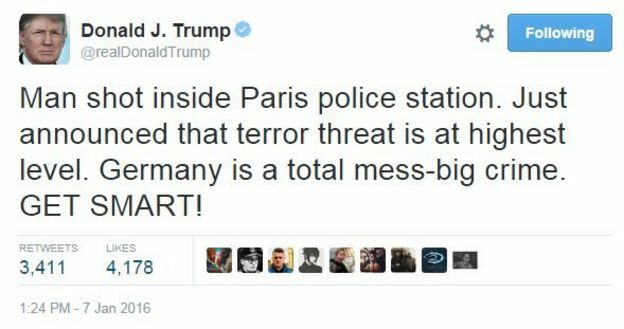 Again, I don’t think the Trump campaign was saying that they think Paris is in Germany, but you always have to be careful with how you phrase your tweets. As frequent readers of this blog know, you can do a lot of damage in 140 characters or less, and your political opponents certainly won’t give you the benefit of the doubt. Don’t make anything easy for them. Republican Tweet: Good News, Racism is Over! Yesterday was the 58th anniversary of Rosa Park’s arrest for refusing to vacate a bus seat for a white man in Montgomery, Alabama. The official Republican Twitter account attempted to celebrate the day. It backfired. Badly. Really? Racism is over? Well, woohoo! #RacismEndedWhen Confederate President Abraham Lincoln freed the slaves from Yankee oppression during the War of Northern Aggression. #RacismEndedWhen the GOP began to suppress EVERYBODY's vote! #RacismEndedWhen Rick Perry turned down #ACA Medicaid expansion to cover poor folks with no access to healthcare. “@liberalgirl4: #RacismEndedWhen Bill O'Reilly discovered that black people use silverware.” —> Not that long ago. #RacismEndedWhen I was told that between two applicants, I got the job because I was white. I walked out. In all fairness, I cannot imagine that there are many Republicans who truly believe that racism is over. Still, this is the latest example of a simple Social Media truth: what you say matters, and neither politicians nor their campaign machinery will get the benefit of the doubt. The mistake is doubly painful for the simple fact that the Republican Party has a well documented history of problems with minorities: 2012 exit polls showed that the GOP Presidential nominee, Mitt Romney, was shellacked by Obama among African-Americans (93-6%) and Hispanics (69-29%), among other minority groups. Previous tweet should have read "Today we remember Rosa Parks' bold stand and her role in fighting to end racism." So the fix was made, but it took way to long; four hours is an eternity in national politics. It is probably safe to assume that the Republican Party has full-time staff dedicated towards managing their significant Social Media presence. As such, there is no excuse for the delay. This should not have taken four hours; this should have taken less than two, if that. The extended time frame gave this incident a chance to spread, with stories appearing in numerous national media outlets like the Huffington Post, BuzzFeed and MSNBC, among others. The moral: when it comes to Social Media, speed kills.